Tom Wilson scored again before being ejected, Nicklas Backstrom had a hat trick and the Washington Capitals beat the New Jersey Devils 6-3 to extend the defending Stanley Cup champions' winning streak to seven games. 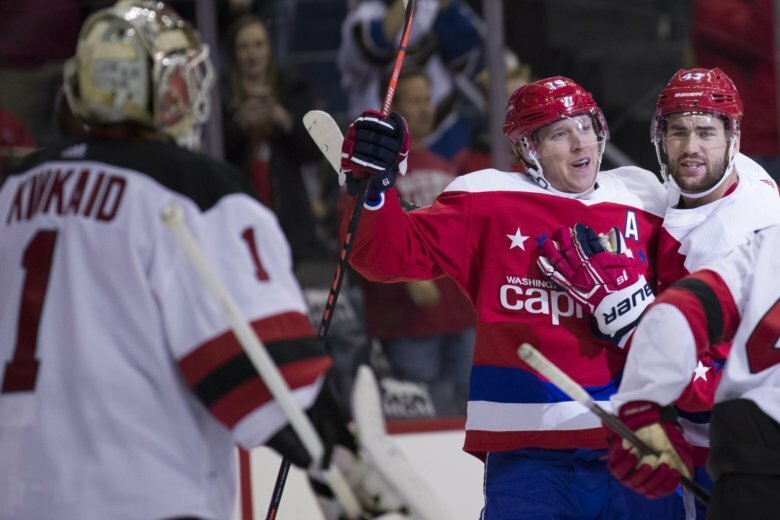 WASHINGTON (AP) — Tom Wilson scored again before being ejected, Nicklas Backstrom had a hat trick and the Washington Capitals beat the New Jersey Devils 6-3 on Friday night to extend their winning streak to seven games. Wilson scored his seventh goal in nine games since coming back from a lengthy suspension, extending his career-best goals streak to five games and points streak to seven. The short-handed goal gives Wilson 13 points, but a hit on New Jersey’s Brett Seney late in the second period put him back in the spotlight for the wrong reason. After Seney released the puck and it had gone into the corner late in the second period, Wilson skated up from behind and hit him with his left shoulder. Wilson was assessed a match penalty for an illegal check to the head, which carries with it an automatic suspension that the NHL must review before deciding to rescind. Wilson, who was given a 20-game suspension that was reduced to 14 for an illegal check to the head in the preseason finale, could avoid being suspended. After review, he did not make principal contact to Seney’s head, it did not look like a predatory play and Deney returned at the start of the third. Backstrom had a hat trick for the first time since Dec. 13, 2014, and added an assist for a four-point game. Alex Ovechkin scored an empty-netter, his 626th goal that put him into sole possession of 15th on the NHL’s career list. Andre Burakovsky also scored for Washington, and Braden Holtby made 33 saves. Travis Zajac, Nico Hischier and Johansson scored for the Devils. SUNRISE, Fla. (AP) — Aleksander Barkov scored at 2:26 of overtime for Florida to hand Buffalo its second loss in two nights following a 10-game winning streak. Jared McCann and Evgenii Dadonov also scored, and James Reimer stopped 20 shots. Sam Reinhart had a goal and an assist and Jeff Skinner also scored for Buffalo. The Sabres were coming off a 5-4 loss at Tampa Bay. DENVER (AP) — Colton Parayko scored 1:34 into overtime to lift St. Louis past Colorado. Vladimir Tarasenko and Alexander Steen scored in regulation, and Jake Allen stopped 27 shots. Nikita Zadorov and Mikko Rantanen scored for the Avalanche. CALGARY, Alberta (AP) — Mikael Backlund had two goals and an assist in Calgary’s victory over Los Angeles. Johnny Gaudreau and Sean Monahan also scored, and Mike Smith made 13 saves for the Pacific Division-leading Flames. Adrian Kempe scored for the Kings, coming off a 3-2 loss at Edmonton on Thursday night. RALEIGH, N.C. (AP) — Ryan Getzlaf scored 1:15 into overtime to lift Anaheim past Carolina. Pontus Aberg scored the tying goal with 3:50 left in regulation. John Gibson stopped 33 shots to help the Ducks win their third straight and for the fifth time in six games. Andrei Svechnikov scored an early goal for Carolina.